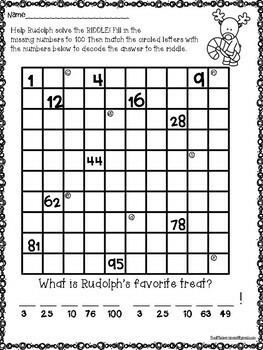 Write the missing numbers to 100 while helping Rudolph solve the mystery riddle. Great practice for number writing to 100 while having some Christmas themed fun! NOTE about PRINTING this product: It is IMPERATIVE that you set your printer driver (settings) "fit to scale" to assure you get the 8.5x11 size. Most printers will adapt to this, for some- you will need to go to your printer settings and click on "fit" or "shrink to size" OR "76%" (it's right there, I promise)....I assure a beautiful fit if you do this!